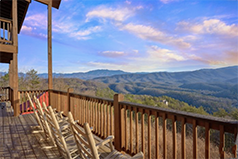 You don't need anything else for your Pigeon Forge vacation in the Smokies. Snuggled Inn has everything you need to make your stay enjoyable. Host a cookout on the charcoal grill for smoky steaks and burgers. Relax and watch the sunset in one of the deck's rockers. Tnjoy the resort's outdoor pool or a community fire-pit for memorable outdoor family gatherings. You will love the convenience of this cabin with its close promixity to all the action. 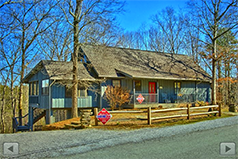 Pool access and being located just under a mile from the Parkway, this Pigeon Forge cabin offers the best of both worlds — the enjoyment of fresh mountain air and area attractions. Keep in touch with those back home or stream your favorite TV shows and movies anywhere in the cabin with WiFi. Relax and unwind year-round in the large hot tub on the covered deck. In the winter, gather around the warmth and ambience of the living room's electric fireplace. Host a family billiard tournament on the game room's full-size pool table. 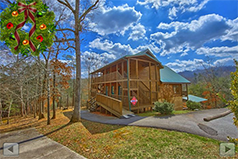 Experience an exceptional Pigeon Forge vacation when you book "Breathtaker," a 5-bedroom luxury cabin in a secluded location only 3 miles from downtown! You won't believe this rental's gorgeous mountain view that allows you to see for miles and miles. 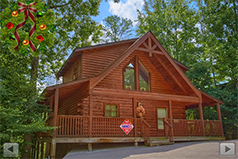 This spacious cabin sleeps up to 14 guests in comfort and places vacationers mere minutes from some of the greatest attractions in the Smokies! Specifically, this secluded luxury cabin provides quick access to traffic light #10 on the Parkway. What a place for a family reunion or church retreat! This big Pigeon Forge cabin. With 7 bedrooms, 7-1/2 baths, a game room with pool table and arcade game, WiFi, and resort pool, you will be staying in the perfect place. This handicap accessible cabin is situated 1.5 miles from all the action. You can even host a cook out on the charcoal grill and gather the whole family at the picnic area that seats 36 people. Have you ever imagined yourself falling asleep to the sound of a mountain river while those you care about are sleeping close by? Well, you can do that at this Pigeon Forge Cabin -- on the creek. For a great retreat, book this big cabin and enjoy the large kitchen, game room with pool table, 42" TV, WiFi, and a hot tub on the deck. 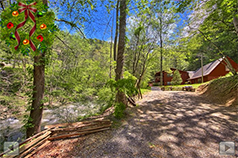 Spend hours resting in a rocking chair, taking in the beautiful scenery, and enjoying the peaceful babble of the the mountain stream that runs by your cabin. A Smoky Mountain retreat to remember! You will enjoy lots of excellent cabin amenities and the cabin’s great location near area attractions. A game room with pool table, wet bar, card table, and fireplace will provide everyone with entertainment at the cabin. WiFi will allow you to stream movies and games in your cabin. The modern kitchen is perfect to cook great meals to enjoy together at the dining table. 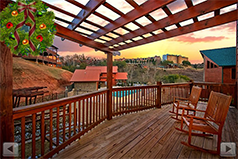 At any time you choose, relax in the hot tub on your screened-in deck as you take in the fresh mountain air. Let your vacation begin in this beautiful cabin situated in a lush, forest setting. There’s plenty of space for kids and pets to play in the large, level yard. Great outdoor features include a year-round family size hot tub on the covered deck, a picnic table and gas grill for your family cookout, a porch swing, and plenty of outdoor seating under the forest canopy. Free WiFi Internet access is available throughout the cabin, so you can enjoy streaming your favorite shows and games in front of the stone gas fireplace in the living room or curled up in bed. 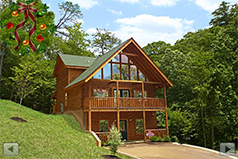 What a romantic Honeymoon Cabin in Pigeon Forge! Situated in Brookstone Village Resort, your cabin will be close to all the action in Pigeon Forge. Snuggle up together on cool winter nights in front of the fireplace. The kitchen with breakfast bar invites you to enjoy a romantic dinner for just two around the dining table in your cabin retreat. A game room with pool table, a deck with a hot tub, and WiFi are added features along with the seasonal resort swimming pool. "Hickory Splash," a private Pigeon Forge area cabin with indoor pool, offers vacationers to the Smokies the utmost in luxury. 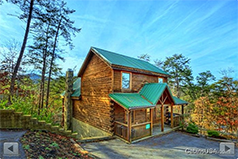 This 2-bedroom Wears Valley cabin near Pigeon Forge offers a cabin in a scenic location with wonderful amenities that still keeps you close to all the action. 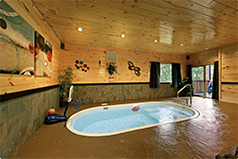 Enjoy year round night and day fun in this cabin's private heated swimming pool and outdoor hot tub! 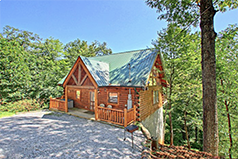 Your Wears Valley cabin with pool offers a chance to relax and unwind in the Smokies. Your 1-bedroom cabin gives guests seclusion and a comfortable interior with all the amenities needed for a comfortable cabin stay for two. With your cabin's prime location and top-notch amenities, you and your sweetheart will enjoy a Smoky Mountain vacation to remember.